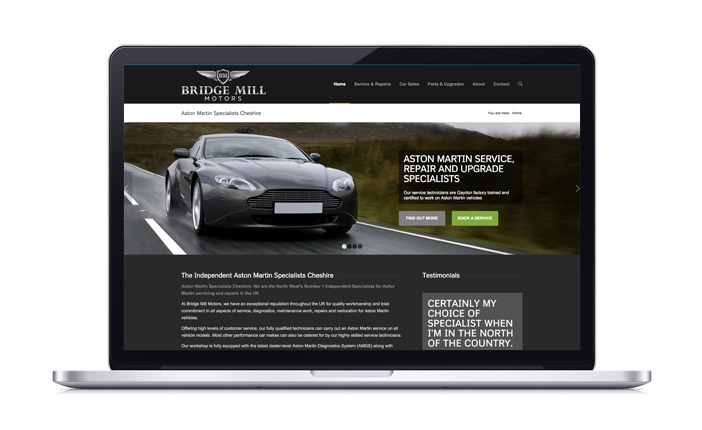 Bridge Mill Motors is an independent Aston Martin specialist garage based in Cheshire. After designing the new logo, signage and press advertising for the business, BMM asked 30two to work with them again to produce a new content managed website. Bridge Mill Motors are building a solid reputation amongst Aston Martin owners for not only being experienced and knowledgable with high performance vehicles, but also a fair-priced alternative to the main dealer network. They needed a website that supported their vision of dealer level quality with independent level pricing. A responsive website was produced that works on all screen sizes from mobile, table to desktop. Not only does the new website look great, but thanks to extensive SEO work, it also ranks well on Google and other major search engines, consistently appearing top, or top 5 on page 1 for key search terms.